Two, three and four bedrooms make up the Bal Harbour Tower and its nineteen stories, a project by Clement DiFillippo. It's located near the eastern side of the affluent village literally steps away from the beach which extends south all the way into Miami Beach. 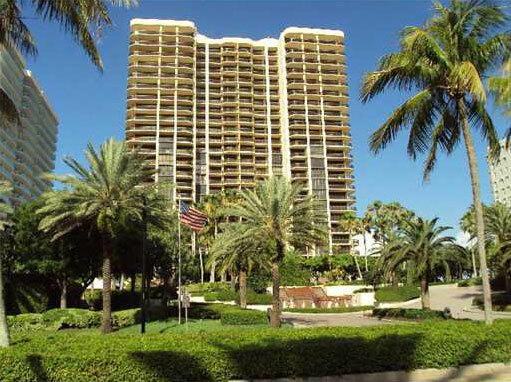 Experience a resort-like lifestyle in this beachfront condominium found within one of the finest communities in South Florida. Spend a day at the beach, at the pool or keep the body in top shape in Bal Harbour Tower's fitness center. Visit the highly acclaimed spa or play some tennis and enjoy a bite at the poolside cafe. The units of Bal Harbour Tower range in size from 3,520 to a whopping 7,190 square for a larger residence and boast plenty of the modern features you'd expect of a building in the village of Bal Harbour. You're going to come across many of the biggest names in fashion like Jimmy Choo, Gucci and Armani at the nearby Bal Harbour Shops. You'll find even more great shopping as well as great dining to the south in Miami Beach. You won't need to travel far if you're looking to sunbathe since Bal Harbour Tower is so close to the beaches and there is even more of it to see and explore to the north in Sunny Isles Beach.